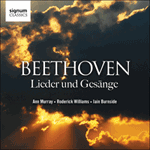 Beethoven took seriously the challenge of fitting music and words together, and the Op 82 Four Ariettas and a Duet, first published in London and Leipzig in 1811, are a case-study in cross-cultural song: the original text in Italian goes hand-in-hand with a singer’s paraphrase in German. Three of the texts (one is set twice) come from the works of the great librettist Pietro Metastasio (the pseudonym of Pietro Antonio Domenico Trapassi, 1698-1782) whose texts were set to music by Handel, Mozart, and a host of other composers. Both Beethoven and Schubert would study composition for a time with Antonio Salieri, and both would set Metastasio to music under his tutelage. But we do not know who wrote the words for the first song of Op 82, Hoffnung (Dimmi, ben mio, che m’ami); in this lover’s plea, Beethoven drapes the reference to the beloved’s smile—“Cara, con un sorriso”—in mildly flowery vocal ornament, followed by a change of tonal place that clearly signifies the paradise of reciprocal love (“tu m’apri il paradiso”). Liebes-Klage, or T’intendo, sì, mio cor comes from Metastasio’s cantata, “Amor timido”, set to music by Antonio Vivaldi and a score of other composers. Because the lover addresses this plaint to his heart, saying that he can hear its wild beating, Beethoven devises a stylized figure in the right part that is evocative both of a palpitating heart and sobs or gasps of lamentation. In mid-song, there is a “purple patch” of heightened intensity to harmonies based on the flatted sixth degree of the scale: this is one hallmark of Beethoven’s musical language. The third and fourth songs, Stille Frage and Liebes-Ungeduld, are actually settings of the same text by Metastasio, L’amante impaziente or “Che fa il mio bene?” from act 2, scene 6 of the second version of his dramma per musica, Adriano in Siria. Here, Beethoven engages in a demonstration of how to derive two different emotional contexts from the same words: the first is subtitled “arietta buffa” and the second “arietta assai seriosa.” The German paraphrases (author unknown), however, register the difference in tone: “Will I never be allowed to approach you?”, the comic lover complains, while the second—perhaps having been given his walking papers in the interim—laments, “And so I must renounce the hope I nourished so long?” In the buffa air, we can practically see the impatient lover pacing back and forth, tethered to the spot where he waits, while the more serious version alternates between slower and faster tempi, between duple and compound metres, like a fever chart of fresh rejection. Love’s utterances, Beethoven tells us, must be interpreted. The set ends with the duet, Lebens-Genuss, to Metastasio’s words, Odi l’aura che dolce sospira from the 1738 “azione teatrale” La pace fra la virtù e la bellezza. Here, Beethoven devises exquisitely rustling breezes and streams in the piano; against this backdrop, the singers both announce that Nature sings of love and that each hearer will know from experience whether it brings delight or sorrow. Dimmi che mia tu sei. The gods their power divine. That you are now in love. No 3: L'amante impaziente Che fa, che fa il mio bene? Sì, sì, mi sembra un dì! What is my darling doing? Perhaps she will not come? How slowly the sun runs its course, every second’s like a day. Perhaps she will not come…? No 4: L'amante impaziente Che fa, che fa il mio bene? ti parla d’amor, sì, ti parla d’amor. si lagna d’amor, sì, si lagna d’amor. se diletto produce o dolor! Know, it speaks to you of love. It complains to you of love. Makes for pain or sheer delight.